Beaphar Care+ for Small Parakeets is a complete, premium bird food, specifically tailored to meet the nutritional needs of both smaller Parakeets. This special food comprises of only organic ingredients, offering an innovation in the feeding these particular breeds of bird. 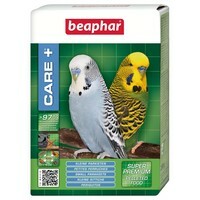 Beaphar Care+ for Small Parakeets should be introduced into the diet slowly, firstly mixing with the bird's current food.